E.N.S.E.T, B.P 1742 El M'naouar, Oran, Algeria. This paper presents a dynamic model of Fuel cell system for residential power generation. The models proposed include a fuel cell stack model, reformer model and DC/AC inverter model. Furthermore a fuzzy logic (FLC) controller is used to control active power of PEM fuel cell system. The controller modifies the hydrogen flow feedback from the terminal load. Simulation results confirmed the high performance capability of the fuzzy logic controller to control power generation. Proton in exchange membrane (PEM) fuel cells is one of the promising technologies for alternative power source of residential power generation in future. However, a fuel cell system is large, complex and expensive Designing and building prototypes is difficult and expensive. The alternative is modelling the fuel cell system for the simulation. The modelling of fuel cell is very important for power system, because it facilitates the understanding of the involved phenomena. Many models have been proposed to simulate fuel cells in the literature -, which have generally each the own specificities and utilities, following the studied phenomena. The model proposed in this paper includes the electrochemical and fluid dynamic aspects of chemical reactions inside the fuel-cell stack. Furthermore, voltage losses due to ohmic, activation, and concentration losses are accounted for. Therefore, this dynamic PEMFC model complements existing models such as the ones developed in , . The model is suitable for power generation. 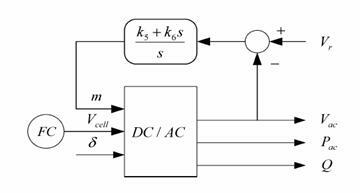 To study the transient response of a grid-independent PEM fuel cell power plant, this paper proposes to an electrochemical model for a 30 kW fuel cell, which incorporates an external reformer to generate hydrogen from methane. Fuel cells are dc voltage sources connected to electric power load through DC/AC inverters. A method to connect the Proposed PEMFC model to a grid-independent through an interface block is presented. The fuel-cell model, an external reformer and its interface block are implemented in MATLAB and incorporated with a power control analysis package. While the protons are transported through the membrane, electrons are carried by an electric circuit in which their energy can be used. Modelling of fuel cells is getting more and more important as powerful fuel cell stacks are getting available and have to be integrated into power systems. In ,and  Jeferson M. Corrêa introduced a model for the PEMFC . 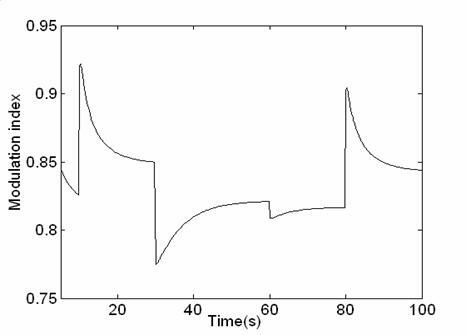 The model is based on simulating the relationship between output voltage and partial pressure of hydrogen, oxygen, and currant. The ohmic voltage drop results from the resistance to the electrons transfer through the collecting plates and carbon electrodes, and the resistance to the protons transfer through the solid membrane. In this model, a general expression for resistance is defined to include all the important parameters of the membrane. where Rc represents the resistance to the transfer of protons through the membrane, usually considered constant. To determine an equation for this voltage drop, a maximum current density is defined, Jmax under which the fuel is being used at the same rate of the maximum supply speed. The current density cannot surpass this limit because the fuel cannot be supplied at a larger rate. Typical values for are in the range of 500–1500 mA/cm . Where B (V) is a parametric coefficient, which depends on the cell and its operation state, and J represents the actual current density of the cell (A/cm) .The static model of the PEM fuel cell is shown in Fig.1, and the parameter are given in Table 1. Table 1. Model parameters ,. In ,  and  Sharkh,Rahman,and Alam. introduced a model of PEMFuel cell system for residential power generation. This model has been modified to introduce a static model show in fig 1 the new model is shown in fig 4. 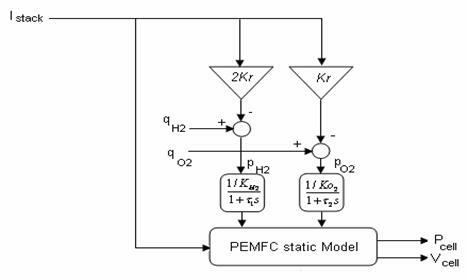 This model is based on simulating the relationship between output voltage and partial pressure of hydrogen, oxygen, and current. A detailed model of the PEM fuel cell is shown in Fig. 4. Figure 5. Fuel cell, Inverter and load connection diagram . Figure 6. The DC/AC inverter model . The equation (21) describes the relationship between output voltage phase angle and hydrogen flow . Equations (13) and (21) indicate that the active power as a function of the voltage phase angle can be controlled by controlling the amount of hydrogen flow. The active power flow from the PEMFC to the load is controlled thought controlling the flow hydrogen. The proposed fuzzy logic controller controls the active power by controlling the hydrogen flow. Were is the flow hydrogen from the current feedback signal were is proportional to the terminal load fig (6), is the methane reference signal and is the hydrogen flow feedback signal. Fig 8 shows the basic fuzzy partition of membership function for error, change of error, and change of control action. 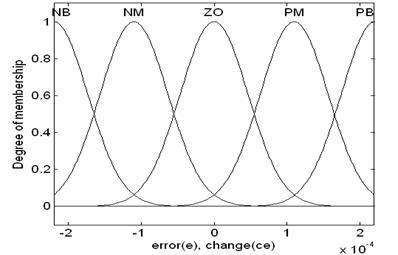 And fuzzy variables are expressed by linguistic variables such as” positive big (PB)” ,positive medium(PM)”,”zero(ZO)”,”negative medium(NM)” ,”negative big(NB)”. Table 2 shows the fuzzy model based on fuzzy rules. The centroid defuzzification method determines the output value from center of gravity of the output membership function and is given by the expression. Based on table 2 and fig 8, the 3-dimensinal representation of control input ( ) for fuzzy variables (e, ce) is shown in fig 9. The model parameter are given in Table 3.The model of Fuel cell system for residential power generation and fuzzy logic block diagram shown in fig (10). 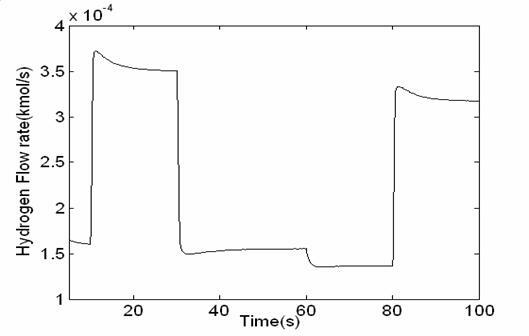 It is tested with step change in the load as shown in fig (11) These abrupt changes in the active and reactive power are for testing the dynamic response of the system and do not necessarily represent change in residential load. In a practical system, the response time of the reformer can be longer than tens second , . 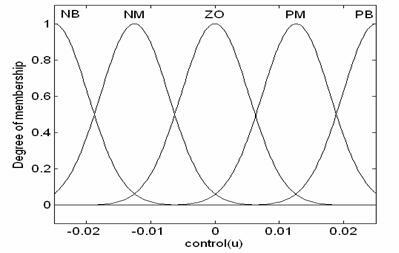 Therefore the reformer controller parameters have significant effect on the active power control. 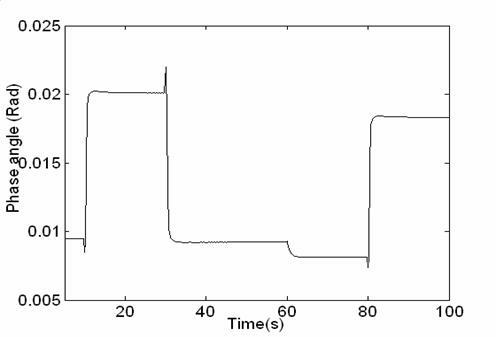 In this simulation the fuzzy logic controller was able to modify hydrogen flow for controlling active power to the load change fig 12. 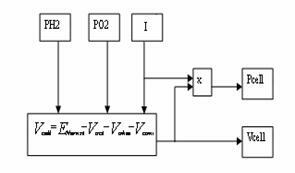 The fuzzy logic controller is characterized by faster time response compared to the PID controllers used in fig 13. Table 3 System parameters , . The change of the current is illustrated in fig 14. This change is very sensitive to variation of the active power load. We notice that, the reactive power value is superior to the reactive power. This is due to inductive effect losses of the line (x). In this paper the fuel cell system model for residential generation is proposed. The proposed model includes a dynamic fuel cell model, a gas reformer model, DC/AC inverter model, and fuzzy logic controller unit block. Then the developed model is tested using computer-simulated step change in the load active and reactive power demands. 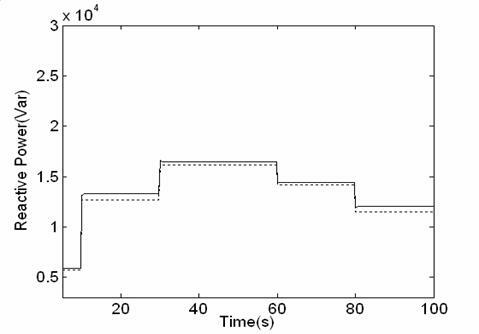 The simulation results indicate that converter and fuel quantities have to be controlled simultaneously to control the active and reactive power. It also indicate that the fuzzy logic controller is very effective to control hydrogen flow for active power load variation. 1. J. C. Amphlett, R. F. Mann, B. 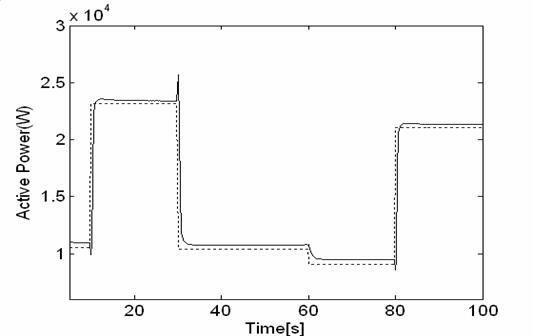 A. Peppley, P. R. Roberge, and A. Rodrigues: A model predicting transient responses of proton exchange membrane fuel cells. J. Power Sources, vol. 61, pp. 183–188, A. B., Name C. D., Title of the article, Journal, 1996. 2. J. J. Baschuck and X. Li: Modelling of polymer electrolyte membrane fuel cells with variable degrees of water flooding. J. Power Sources, vol. 86, pp. 181–196, 2000. 3. 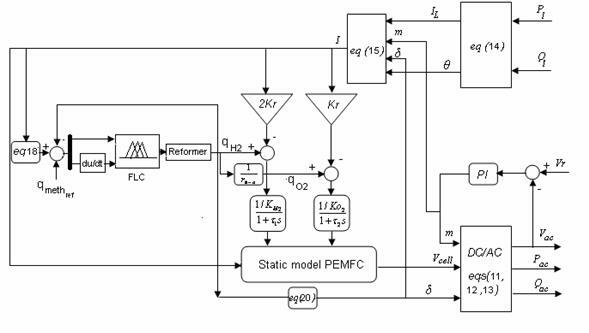 P. Famouri and R. Gemmen: PEM fuel cell electric circuit model. presented at the Power Electronics for Fuel Cells Workshop, Nat. Fuel Cells Res. Center, Univ. California, Irvine, CA, Aug. 8–9, 2002. 4. C. J. Hatziadoniu et al. 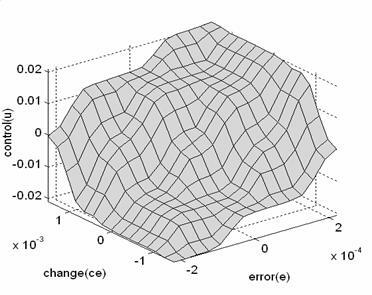 : A simplified dynamic model of grid-connected fuel-cell generators. IEEE Trans. Power Delivery, vol. 17, pp. 467–473, Apr. 2002. 5. 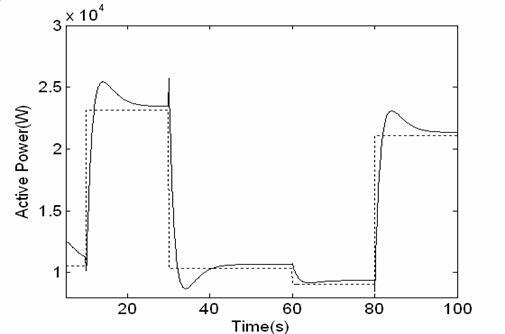 Jeferson M. Corrêa, Student Member, IEEE, Felix A. Farret, Luciane N. Canha, and Marcelo G. Simões : An Electrochemical-Based Fuel-Cell Model Suitable for Electrical Engineering Automation Approach. IEEE Transactios on Industrial Electronics, vol .51, No 5, Octobr 2004. 6. Jeferson M. Corrêa, Student Member, IEEE, Felix A. Farret, Jonas R. Gomes, and, Marcelo Godoy Simões, Senior Member, IEEE: Simulation of Fuel-Cell Stacks Using a Computer- Controlled Power Rectifier With the Purposes of Actual High- Power Injection Applications. IEEE Transactios on Industrial ,Applications, vol 39, N04, July/August 2003. 7. M. Y. El-Sharkh, Member, IEEE, A. Rahman, Life Senior Member, IEEE, M. S. Alam, Senior Member, IEEE, A. 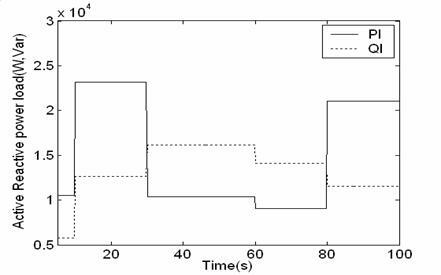 A. Sakla, Senior Member, IEEE, P. C. Byrne, Member, IEEE, and T. Thomas, Member, IEEE: Analysis of Active and Reactive Power Control of a Stand-Alone PEM Fuel Cell Power Plant. IEEE Transactios on Power Ssystems , vol .19, N04, November 2004. 8. M. Y. El-Sharkh and M.S Alam: A dynamic model for a stand-alone PEM fuel cell power plant for residential application. J. Power Sources, , submitted for publication, June 2004. 9. 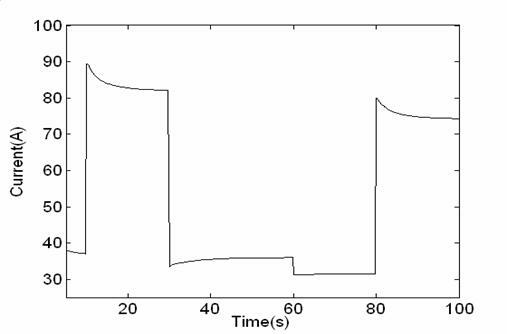 M. Y. El-Sharkh , A. Rahman and M..S Alam: Neural networks-based control of active and reactive power of a Stand-Alone PEM Fuel Cell Power Plant. J. Power Sources, 19 June 2004, Available online. 10. Abhishek Sakhare, Asad Davari and Ali Feliachi: Fuzzy logic control of fuel cell for stand-alone and grid connection. Journal of Power Sources, Volume 135, Issues 1-2, 3 Pages 165-176, September 2004. 11. Kisacikoglu, M.C. ; Uzunoglu, M.; Alam, M.S: Fuzzy Logic Control of a Fuel Cell/Battery/Ultra-capacitor Hybrid Vehicular Power System. Vehicle Power and Propulsion Conference, VPPC 2007. IEEE Volume , Issue , 9-12 Sept. 2007 Page(s):591 – 596, 2007.